Infinite Summer • View topic - Steeply and Twin Peaks' Dennis/Denise Bryson?? Post subject: Steeply and Twin Peaks' Dennis/Denise Bryson?? I'm still reading, slowly, though I haven't posted here in a while because I'm behind, so even the Daily Discussion contains spoilers for me. 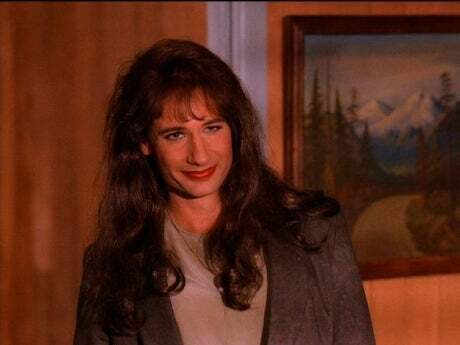 So I don't know if this is old news to everyone else, but I was mentioning the cross-dressing investigator Hugh/Helen Steeply to my boyfriend who hasn't read IJ but is a David Lynch fan and he immediately mentioned David Duchovny's character on Twin Peaks. Namely, cross-dressing DEA investigator Dennis/Denise Bryson. Is this a nod from DFW to DL? Post subject: Re: Steeply and Twin Peaks' Dennis/Denise Bryson?? I believe Wallace was influenced by Lynch/Twin Peaks and make several connections between IJ and images in Twin Peaks (including the one you noted) in Elegant Complexity. There's a line lifted straight from Miguel Ferrar's character: "Look, it's trying to think." In one report, Avril's hair turns white overnight like Leland's. And several more. Unfortunately, based on Marathe's observations of Steeply's appearance, I don't think Hugh pulls Helen off as well as Dennis pulls off Denise! that's rad. important to remember, though, that Denise was a transvestite of volition--not "merely" going undercover. Spoiler! "of course, Denise did come to Twin Peaks because the FBI was afraid that Cooper had gone "rogue" and was trafficking drugs into Twin Peaks from Canada himself. This was a complaint brought up by a Canadian Mounty who was actually a double agent himself--a drug trafficker in disguise posing as a government official in order to kill Cooper at the behest of Quebecois evil mastermind Jean Renault! does kinda remind me of the whole Steeply/Marathe relationship, when you think about it. or a musical chairs version of it. Ha, I had forgotten about the whole fraught Canadian level in Twin Peaks altogether. Two of the most overt locations of evil in that show are the "black lodge"--a weird time-space blip in the woods--and One-Eyed Jack's IN CANADA." Ha. Oh DFW, you really WERE a Twin Peaks junkie!